Latest Sale reports on the best abstract art limited edition posters for green wall coverings. The bright, earthy endeavours of lime green wall coverings attract contrasting colours that add a touch of glamour to walls. The vast array of abstract art limited edition posters from abstract artist Ali Jabbar includes purple and deep blue tones that add prominence to lime green walls. These portrait paintings from the Ali Jabbar abstract artwork collection includes Bus Stop I and Bus Stop II, examples of transformational abstract art that is perfect for living room settings or commercial environments such as offices. For private dressing rooms and dressing areas, Ali Jabbar’s conceptual abstract art piece “Fitting Rooms” is a reflection of elegant cloakrooms and our relationship with them. Such abstract art limited edition posters offer a marked improvement to a green wall in need to an inviting message to residential visitors. Wall coverings offer an identity with this abstract art piece. Stripping off clothes behind closed doors in the privacy of your dressing room is the perfect location to experiment with clothes, even those that may or may not fit our bodies. The artist’s interpretation that reflects this dressing room setting highlights the time spent getting to know our real identity in front of the hidden mirrors in these locations; a time when we need to move the curtain aside in order to see who we really are. The clothes extend to the dimensions of the body and the body exposes its dimensions per millimeter. 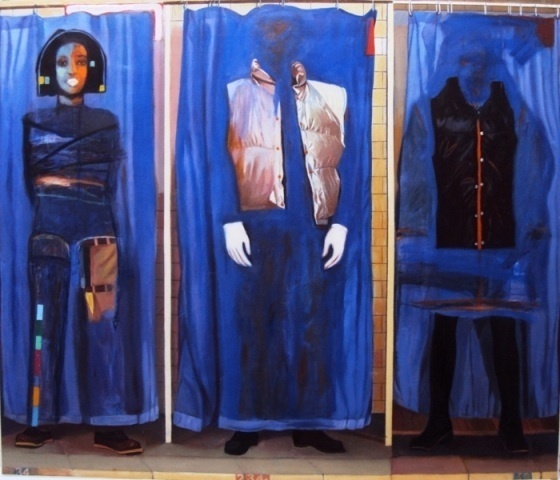 This may not seem important for some people but the artist remains highly intrigued by it because the process of stripping off and changing behind curtains points to significant aspects of human conduct. Secrets are revealed in public whilst remaining hidden behind a curtain.